NEW WILMINGTON, PA – Westminster College has been named a Best College for the Money by College Factual, ranking among the top 5% of schools across the country. 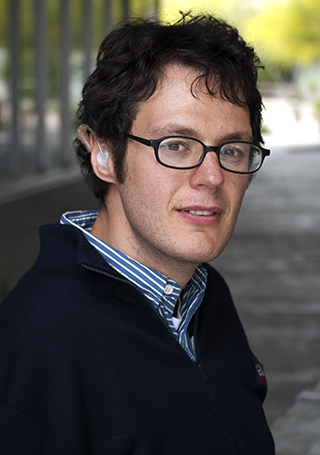 NEW WILMINGTON, PA – Award-winning and internationally acclaimed poet Ilya Kaminsky will read from his works at 7 p.m., Wednesday, March 6, in the Maple-Witherspoon Room of Westminster’s McKelvey Campus Center. Ashley Kress ’12 always thought she would become an English teacher, but after some stops and starts, she found her true calling in digital marketing. Two members of the recently formed Westminster Speech & Debate Society competed in the Novice National Forensics Tournament, March 9-11 at Suffolk University in Boston. Sophomore English Julie Yesko and senior communication studies major Christian Na represented Westminster in a field of 25 colleges and universities from across the country. The beauty of a liberal arts college is that students are not only able to try their hand in different disciplines, but they are encouraged to do so. Junior English major and marketing minor Margaret Portmann embodies the essence of Westminster’s liberal arts curriculum by letting her different interests complement one another. Poetry slams have the reputation of being platforms for some of the rawest and most honest poetry ever shared. Imagine poets battling mic to mic for a shot at a grand prize; going round for round with clever metaphors and similes. Whether you prefer to witness or participate in this intense battle of wordplay, the energy of slams is pulsating and will leave your lyrical hearts thoroughly satisfied. Sigma Tau Delta and Scrawl’s 2nd annual Poetry Slam promises to do just that. USA Today reports that Westminster College ranked #1 in the Middle Atlantic and Pennsylvania offering the “Best Colleges for the Money,” according to College Factual. Catching up with Kara Knickerbocker '12 may be hard to do in between the many moving facets of her life. After a full year of visiting over seven countries and running her first marathon six months after receiving a pacemaker, no wonder why her goal for the rest of 2017 is to honestly slow down. Victoria Volkay, senior English major, won the 2017 Dr. Frederick Horn Capstone Award for her capstone project entitled “The Humanity in Holmes: A Character Study on the Personality and Relationships of Sherlock Holmes in Literature and Film.” Volkay’s capstone focuses on Sherlock Holmes’ personality and his relationships with various characters in the original stories, and how those relationships translated to several of the most famous film adaptations by Basil Rathbone, Jeremy Brett, Robert Downey Jr., and Benedict Cumberbatch.